Agents Of S.H.I.E.L.D. doesn’t take very many risks, but maybe it should. “4,722 Hours” abandons this season’s overarching Inhumans and Hydra plots for an entire episode about how Jemma Simmons’ survived on an alien planet for over six months, and it’s a high point of the series that shows the value of breaking from the established formula. The story is one long character study giving Elizabeth Henstridge the opportunity to show off the depth of her acting ability, and the rich development given to Simmons this week makes me wish every member of the cast could get teleported away for a terrifying extraterrestrial experience. The most obvious comparison point for “4,722 Hours” is this fall’s box office juggernaut The Martian, what with both stories featuring characters trying to survive on their own in alien environments, but there’s also a lot of The Twilight Zone in this episode’s DNA. Like that TV series, the Agents Of S.H.I.E.L.D. creative team is working with a relatively small budget (especially compared to a big-screen blockbuster like The Martian), and that restriction forces writer Craig Titley and director Jesse Bochco to take a more intimate approach to a sci-fi narrative. While The Martian is a very personal story, the scope is large, jumping from Mark Watney’s struggle on Mars to NASA’s efforts on Earth and the Hermes spacecraft to bring him back home. “4,722 Hours” is all about Simmons, and even when another character is introduced—bearded astronaut hunk Will Daniels (Dillon Casey)—the focus still remains firmly on her. 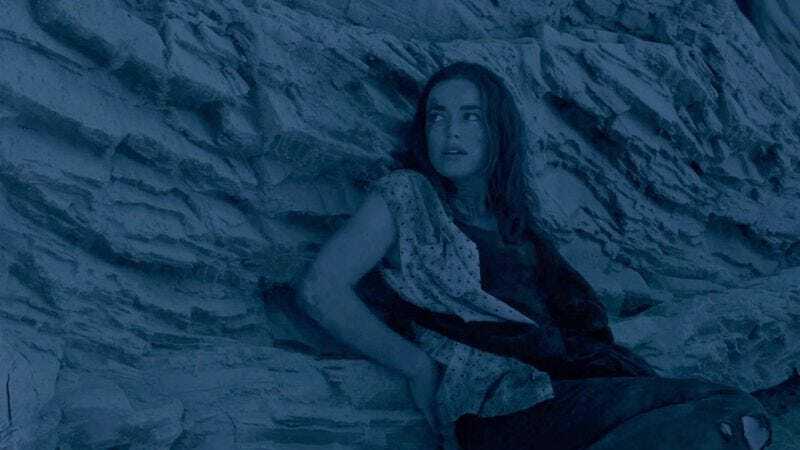 Despite my initial disappointment that Agents Of S.H.I.E.L.D.’s first foray into space doesn’t offer much in terms of imaginative sci-fi production design, keeping the visual elements grounded draws the viewer’s full attention to Henstridge’s performance. As much as I want to see some cool alien makeup, making the only other character Simmons interacts with an American human allows Titley to build up their relationship without spending too much time on the inevitable questions an alien character introduces. There is some sort of alien presence on the planet, but it’s heavily obscured in its first appearance and when it appears again, it appears as a NASA astronaut to trick Simmons. The alien doesn’t have an identity (yet), which makes it a more ethereal threat for Simmons and Will, one that represents the general danger of the terrain. This show’s drab color palette is a significant weak point, but the limited colors of this week’s episode actually work in favor of the plot. Using a blue lens filter is a quick, easy way of turning the California desert into an alien landscape of endless night, and over the course of the episode, the monochromatic environment becomes more and more oppressive. When there’s any variation in color, it’s a significant event: The red of the flame Simmons makes to cook the “plant monster” that tried to drown her is the first visual indicator that things are getting slightly better for her, and even though she wakes up in a cage on hour 761, the warm brown of the cave announces that this is actually a positive development. Anything that gets her away from that harsh blue is a plus, and her human captor quickly becomes her only ally. Once Will is introduced, it’s not difficult to figure out why present-day Simmons is so desperate to return to the alien planet she left behind. It could be friendship, but considering Will’s handsomeness and Simmons’ reluctance to tell Fitz what happened during her time away, it’s obvious from the start that they’re going to be a romantic pair. The journey is more important than the destination, though, and the bond between Simmons and Will develops organically as their hours together turn into days, then weeks, then months. For most of this time, Simmons is still intensely devoted to Fitz. When she first finds herself stranded, she keeps her composure by thinking like a scientist, but once it starts to sink in that no one is coming for her, she starts to get more emotional and turns to her memory of Fitz for support. She imagines the date they’re supposed to go on and worries that their bond won’t maintain in a romantic context, and Henstridge does great work showing how Simmons’ relationship with Fitz gives her the strength to press on. Throughout the first half of the episode, Simmons records voice memos for Fitz detailing her fear regarding the scarcity of food and water, her insecurity about her chances of making it through this alive, and her pride when she discovers what she’s capable of accomplishing when survival is her one and only goal. It allows Henstridge to vocalize all of Simmons’ turbulent emotions, and she fully captures all the desperation Simmons feels as she spends more time alone on an alien world. The thing that keeps her motivated is the hope that she’ll one day make it back to Fitz and the rest of her friends, but when that hope fades, her romantic commitment to Fitz fades with it. At 31, Dillon Casey is way too young to play an astronaut that has been lost in space for 14 years, but the damaged intensity he brings to Will makes him a strong foil to Simmons’ optimistic character. As Will says, Simmons is the voice of hope while he’s the voice of doom, which gives them a very different dynamic from Simmons and Fitz. Opposites also attract, especially when they’re the only two human beings on an entire planet, so when Simmons loses faith that she’s going to make it back to Fitz, she starts giving her heart over to Will. Because this is basically a two-person show this week, Titley can devote ample time to developing the pair’s relationship, and he does so with intimate scenes like the conversation where Simmons reveals that her childhood scoliosis was directly responsible for her fascination with the stars. There’s a noticeable change in Simmons’ disposition once she and Will kiss and start sleeping together (at least that’s what we’re led to believe by the shot of their two beds now side-by-side), and showing Simmons at her bleakest point earlier makes it easier to accept this new relationship by showing how it drastically improves her outlook. Her romance with Will significantly complicates the one she has with Fitz, but Fitz doesn’t let jealousy take over when Simmons finishes recounting her experience. He rushes out of the room, but it’s not because of anger. Instead, he rushes to the lab to start figuring out how to bring Will back because Fitz is that good of a friend. Fitz isn’t going to hold it against Simmons that she found solace in the arms of another man when she was stranded and fighting for her life on another planet for half a year, and while it’s not the ideal situation for Fitz, he’ll do anything to make his best friend happy. If that means reopening a portal to an alien world to save the man who took his place as Simmons’ love interest, he’ll do it with no questions asked. It’s a heartwarming moment for the two characters, ending an exceptional episode by highlighting the relationship that kept Simmons alive for so long. Dramatically changing the title card is a great way of immediately establishing that this is going to be a very different episode. I gasped when it came on screen. Could Simmons and Will be on Ego the Living Planet? I would be very down with that. “4,722 Hours” is removed from the other plotlines this season, but it teases a very intriguing story thread for the future: Who are the people that supplied NASA with the information that the Monolith was a portal to an inhabitable alien planet? There was definitely something shady going on when NASA sent Will and three other astronauts through the Monolith back in 2001, and I have the feeling that’s going to come back into play at some point. I’m just going to assume that Simmons’ phone has some sort of Stark Tech battery that lasts for months on end because that’s probably one of the least far-fetched things in a superhero universe. Bobbi’s back in the field next week! YAY!! !